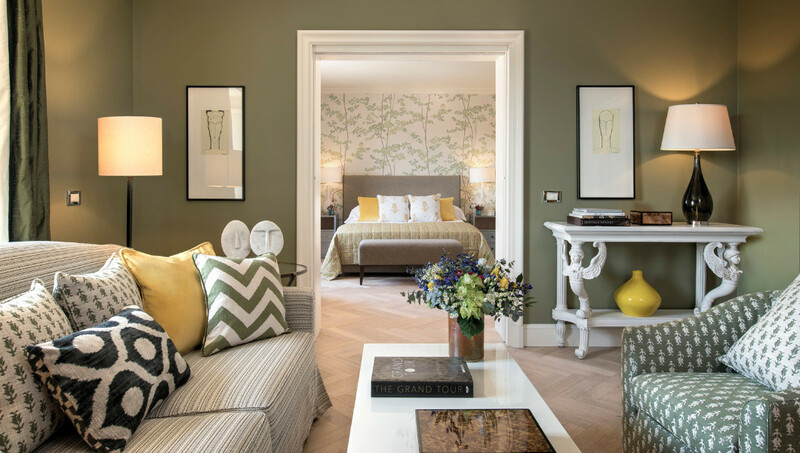 The 125-year-old Hotel Savoy on the Piazza della Repubblica has reduced the number of guestrooms from 102 to 80, creating more space and a blank canvas for the new interiors. All the rooms have been given a fresh, contemporary look created by Polizzi and Laudomia Pucci, image director of the fashion house. Décor from renowned local artisans including Il Bronzetto and Chelini Firenze, and fabrics from C&C Milano give all of the rooms a decidedly luxurious Italian finish. The refined two-bedroom Duomo Presidential Suite occupies its own wing and enjoys superb views of the Duomo, while the two-level Panoramic Suite on the 5th floor boasts 180-degree views of Florence. Pucci has created a pair of exclusive scarf prints in pink and turquoise, which pay tribute to atmosphere and architecture of the Tuscan capital. The scarves can be seen throughout the hotel, and form a unique base for the glass tabletops at the signature Tuscan restaurant, Irene. The hotel’s entrance has been restored to its former grandeur and now welcomes guests into a five-metre high space that flows into an all-white lobby, which pops with striking Pucci accents: floral velvet armchairs, sofas in black and fuchsia, and paintings by Luca Pignatelli. Underfoot, Pucci’s iconic Lamborghini print has been recreated on a hand-tufted rug in shades of pink grey, white and black.